About a few weeks ago, I was diagnosed by an ophthalmologist who said I was born with a cataract in both my eyes, though the left one is completely blurred of vision. Thing is, I'm only in my early twenties... this isn't supposed to be happening, haha. I've always had poor vision since I was younger, but I had never been told such a thing by any specialist or eye doctor I've ever visited. After inspecting my eyes, he concluded that cataract surgery isn't a recommendation considering my left eye is 5mm smaller than my right, and any doctor who would accept and perform the surgery "wouldn't have my well-being at best interest". I was finishing up Humaworm around that time. 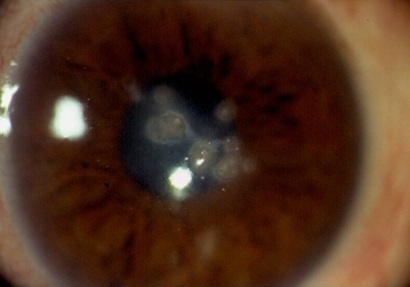 In the beginning, around the second day of taking the capsules, tiny cysts started to form at my cornea. At present, they're still there. At the back of my mind, I had always suspected some parasites wandered around my left eye, because what followed on the side of the cysts on my left eye were like transparent tails that would shine in a specific angle of light. 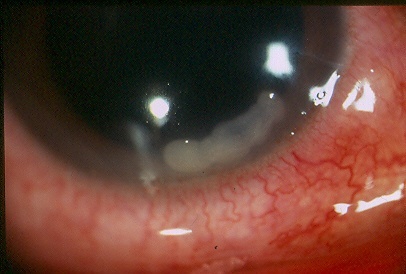 If you looked at it head on, it would just look like filamentary keratitis (which the ophthalmologist also said I had). But I'm really not 100% sure what they are, to be honest. Last night, I tried oregano oil with a carvocol of about 85%, diluted in some oil oil. At the first application, the eye dropper didn't seem to get the extra olive oil so my eye stung reallllllll bad. BUT I saw that one of the two worms started to recede. Its outline was still there (the light shone it) but it had drew back. This morning, I (successfully) diluted the oregano oil in olive oil and applied it to my eye in intervals... and then two more white bodies appeared in my cornea. I guess they wanted to say hi. So rather than the two I thought I only had, I now have at least 4. 1] I have no idea if these are roundworms or Tapeworms or bacteria. While I have had the experience of seeing a 1cm roundworm pop out of my head, I can't say for certain if its the same sort socializing in my eye. And based on what I've read around Curezone, hookworms can travel towards the eye and like it just as much as pork Tapeworms do. Anyway, it looks like a combination of these two pictures of Staphylococcus aureus (bacteria) and this loa loa parasite (2nd photo). So just take the bulb-end of the Staphylococcus aureus and then attach a loa loa body to imagine what it looks like. I thought they were pork Tapeworms due to the cysts, but then bacteria can form cysts too. 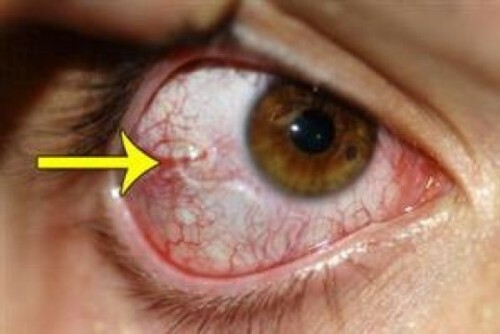 These are what the bulbs on my eyes look like in a photo featuring Streptoccocus pneumoniae keratitis. It's a pretty accurate match. 2] Second dilemma - I am on a tight budget. I had to quit both my jobs because my candida got so out of hand that it affected my face, turning it blotchy, rashy and red. At the moment, I'm trying to heal all my ailments to a point where I can start working again. (Currently on a Candida Cleanse from Humaworm.) As of now, I'm pinching pennies. I don't know what I'm battling, let alone what method to cure it would be. God forbid them to be tapeworms, as I have no money to buy Niclosamide, Praziquantel AND Albendazole. Nor would I know if that would be a better alternative to Clark's L-Cysteine, Ozonated Olive-Oil + CoQ10 combo. I would prefer to stick to an herbal route. I'd rather not overtax my liver with Albendazole (if I had to buy it) since its overwhelmed by toxins already. I've read in some posts that metal toxicity can be related to eye problems too? Should I do a metal detox also? Currently, I'm waiting for these ayuverdic eye drops to land on my doorstep. But for now, I use over the counter eye drops to lubricate them as well as some coconut oil. If anyone can help me identify what the heck is in my eyes, that would be lovely.